Hey sweet ones! Wednesday has rolled around once again and that means it's SIL Sisters in Christ Day! Today we're looking at John 16 as part of our Jesus 101 study, looking at the Gospel of John. John 16 is the third out of a total of four chapters where Jesus is teaching His disciples after the last supper - and it's here that Jesus talks of the struggles His followers will face. These struggles are still the same which we suffer today as Christians - but Jesus tells us exactly how we can deal with them and how we can turn our sorrow into joy! "They will do such things because they have not known the Father or me"
And I think that's something we all need to remember. Our first reaction, when someone embarasses or mocks us is to get angry, right? Not everyone is going to share our beliefs in life - especially when it comes to God. In fact, growing up, my Dad and Pa always taught me there were two things you should never speak about to others; politics and religion. Why? Because they're two of the most controversial subjects that are bound to cause conflict at some stage. It's here that I apologise to my Dad and Pa because I'm clearly breaking that rule as I love talking about Jesus - but I also know and understand that at times doing so will see me face rejection or ridicule or awkward moments. 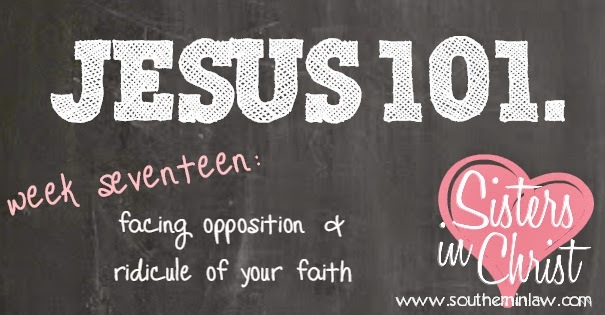 Luckily for us, Jesus tells us exactly how we should deal with persecution in our lives. Paul warned us in 2 Timothy 3:12 that "everyone who wants to live a Godly life in Christ Jesus will be persecuted" - and whilst the severity of that persecution differs from person to person, Jesus told us to expected persecution from the world because if they persecuted Him, they'll persecute His followers too. In fact, throughout the Bible, Jesus makes it very clear that those of the world will hate us because they hate Him. As Christians, we should be influenced by different principles from those of the world - and that makes us different. That makes us weird, abnormal, strange - all those terms that most of us spend our lives trying not to be. We each have an incredible urge to fit in and belong - yet as Christians we should be doing the opposite. We don't belong to the world so we can't fit in with those who do. We are motivated by the love of God whilst the world is driven by the love of sin. Money. Possessions. Power. Success. As Christians, we need to learn to recognise just how important persecution is - because when we're persecuted or mocked by others, we realise that we're actually on the right track. We shouldn't be snobby and stuck up about it, but quietly and humbly realise that Jesus told us from the very beginning that we'd be persecuted for walking through life with Him - and if that's the downfall, so be it! Persecution and trials test our faith and allow us to realise where our true priorities lie. It's easy to be hateful in situations where you're embarassed, however, it is much more Christ-like to remain calm and respond in kindness towards opposition. It might seem impossible, but that's why we have the Holy Spirit - and we can ask God to allow the Holy Spirit to work within us so that we may bear the fruit of the spirit. Love so that you can love those who persecute you. Joy so that you can rejoice in your relationship with Christ and the knowledge that you don't belong to this world. Peace so that you can walk away unshaken. Forbearance & Self Control so that you don't bite back or retaliate in anger. Kindness so that you can be kind to those who mock you. Goodness so that you make the right choices. Faithfulness so that you can turn to God for support, strength and courage in these situations. Gentleness so that you can respond in a more Christ-like way. We can thank God for His grace and patience with us, expressing our gratitude for those people in our life who also share our faith and stand with us in times of distress - but just as importantly, we can pray for those who accuse, abuse and misuse us because those prayers are exactly what they need. Now, there is so much more to soak up and absorb in John 16, but today I really wanted to focus on how we can face judgement from others as Christians as it's something I hear about (and experience personally) all too often - and something we all need to learn how to deal and cope with. But tell me, do you have any advice for your fellow sisters on how you deal with opposition and ridicule?